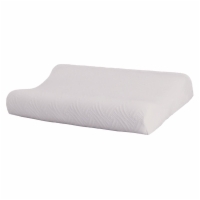 A memory foam pillow's contoured shape and low height give superb head and neck support without straining your neck muscles. It can be used no matter what position you sleep in - stomach, side, or back. Memory foam pillows come with a Matlasa cover. Standard Size: 12" x 20" x 4"